PODCAST 139 IS ON THE INTERNET NOW!! Well guys, I think the tittle says it all. In this episode: With Derrick at Coachella, we must find the strength to carry on without him. We bring some friends in to fill the void...but can it be filled? We talk about the new leaked iPhone photos, Super Street Fighter 4, and LOST. 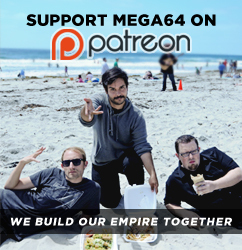 Plus, we talk about our new "3DS" video and wonder: Has Mega64's 15 minutes run up?!?! That and much more. Click here for the audio! Welp, that's it for now. Stay tuned for a video update from Rocco.